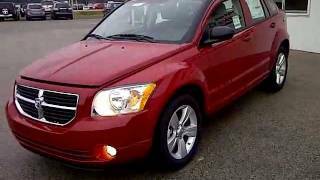 Dodge Caliber 2012 is a no-frills entry-level 5-door compact car available in the 3 trim levels - SE, SXT and SXT plus. Caliber 2012 is powered by a 2.0L I-4 Gas engine that has power of 158 HP and torque output of 191Nm. The car offers fuel economy of upto 32mpg on highway and has a starting price of $17,380 excluding destination charges. 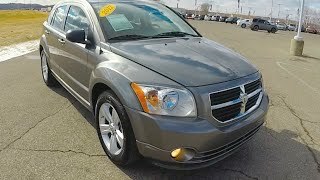 September 1, 2011 ,Auburn Hills, Mich.-	The 2012 Dodge Caliber is a versatile five-door compact vehicle with a distinctive coupe-like profile that projects the strength, stance and functionality of a sport-utility vehicle (SUV) but at the price of a compact sedan. With highway fuel economy of up to 32 miles per gallon (mpg) and a starting price of $17,380 (excluding $750 destination) the 2012 Dodge Caliber offers consumers a small-footprint vehicle with the right amount of attitude that’s also fun to drive. A simplified model lineup for 2012 includes Caliber SE, SXT and SXT Plus models. Calibration improvements to the available continuously variable transmission II (CVT2) provide drivers with better launch acceleration, smoother deceleration, improved pedal responsiveness and reduced engine noise. 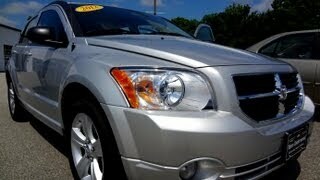 Customers who want a sensible, fun ride will find that the 2012 Dodge Caliber SE model has everything they want. It offers consumers value, efficiency and safety coupled with many standard, innovative and useful features, proving that practical doesn’t have to be boring. It’s powered by the fuel-efficient 2.0-liter dual overhead cam (DOHC) I-4 World Gas Engine with dual variable-valve timing (VVT) that produces 158 horsepower (118 kW) and 141 lb.-ft. (191 N•m) of torque and is mated to a five-speed manual transmission. This powertrain is rated by the EPA at an estimated 32 miles per gallon (mpg) on the highway. Standard features include air conditioning, Chill Zone™ beverage cooler, active head restraints, advanced multistage front driver and passenger air bags, supplemental all-row side curtain air bags, anti-lock front disc and rear drum brakes, electronic stability control, Brake Assist, halogen headlamps, Hill-start Assist, illuminated cup holders, remote keyless entry, Media Center 130 CD/MP3 radio, 15-inch wheel covers, power heated mirrors, power windows, power locks, rear 60/40 fold-flat seat, fold-flat load floor storage, rearview automatic-dimming mirror, rear window defroster, rear window wiper/washer, Sentry Key® theft-deterrent system, sliding front center armrest, speed control, tilt steering column, tire-pressure warning light and five-speed manual transmission. The 2012 Dodge Caliber SXT model is a versatile, all-around performer with something for everyone. The Caliber SXT is a comfortable, safe vehicle that is fun to drive and stands out from the competition. The SXT model’s standard features include the standard features of the SE model, as well as CVT2, four-wheel anti-lock disc brakes, 17-inch aluminum wheels, touring suspension, tachometer, interior removable/rechargeable flashlight, Sirius XM satellite radio, front fog lamps, driver seat height adjuster, fold-flat front passenger seat and a rear 60/40 fold-flat reclining seat. Customers who want a sportier style both inside and out will enjoy the nicely packaged 2012 Dodge Caliber SXT Plus model. Standard features include the features of the SXT model, as well as a sport-tuned suspension, Auto Stick, 18-inch polished-aluminum wheels and premium performance tires and sport appearance group. The 2012 Dodge Caliber SXT Plus is sporty transportation with maximum versatility. The 2012 Dodge Caliber is available in the following exterior colors: Black Clear Coat, Bright White Clear Coat, Bright Silver Metallic Clear Coat, Redline 2 Pearl Coat and Tungsten Metallic Clear Coat.